Entertain in style with this set of eight elegant wine glasses. 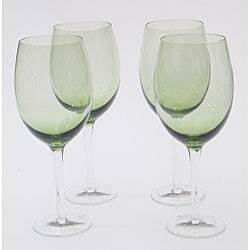 Featuring a relaxing olive green tint and 20-ounce capacity, the glasses are ideal for your next dinner or soiree, and the set is machine washable for convenient cleanup. Click here for the entire Colored Stemware collection. Great wine glasses! They look pretty and feel great in your hand. Great value and just in time for the holidays. Your guests will appreciate the generous size. These glasses are well made and wash easily. We hand wash them but they should be "dishwasher-able" although I worry about the high heat of our washer. These glasses are absolutely beautiful and matches my decor perfectly. We just received them and haven't had a chance to use them yet, however, they feel good in the hand, and are a nice weight.